A fast-moving and witty film, the humor doesn’t always work here, but the storyline is a lot of fun and moves at a quick and relentless pace. A very funny movie with a great premise, this film is all about a giant misunderstanding. Most movies can’t exist on a single idea like that, and this movie is smart enough to know that it can only be ridden out until about the haflway point, before a change is necessary. So for the first half of the film, there is a woman who thinks that these Hollywood stars are real heroes who have come to save her town, and the Amigos believe that they have been recruited to put on a show. But then everyone realizes the truth and we get launched into the second half of the movie, where the Amigos have to become heroes for real. While some of the jokes are dated and don’t quite work, the single thing that drives this movie most is its pace. While we get plenty of extra fun scenes, such as the boys in the desert on their way from one place to another, each scene moves quickly, and is straight to the point. That enables us to have all sorts of introduction and setup scenes with the boys still in Hollywood, and two different climax scenes as well. This is a movie that knows that pacing and timing are everything, and it keeps on moving, joke after joke, the whole way through. The Three Amigos is a classic Hollywood 80s comedy. It’s one of the more perfect films by director John Landis, who made a name for himself working with the breakout stars of the original Saturday Night Live cast. Landis directed Animal House, The Blues Brothers, Coming To America, Trading Places, and this film. He worked closely with John Belushi, Dan Akroyd, and Eddie Murphy. He worked with each of those actors more than once, on some of these more well-known films. 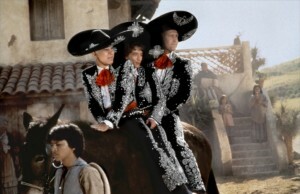 With The Three Amigos, he was working with three new stars, each for the first time, and together they were able to turn out one of the best films in each of their careers. The movie works as both a comedy and as an action adventure. It’s about three actors who get mistaken for the characters they play on the screen and get called in to a real Mexican town to save the day from an evil dictator. The story about these three men coming in and helping the people of the town is a take on the classic story The Seven Samurai. That Akira Kurosawa film was then remade as The Magnificent Seven. 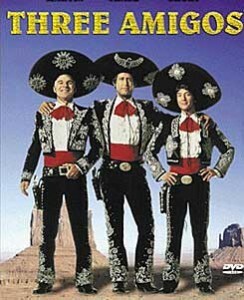 With The Three Amigos, we get the comedic version, about heroes who are not brave, are under a complete misconception, and definitely do not want to be there. The three actors here are Steve Martin, Chevy Chase, and Martin Short. Martin is the best of the bunch of them, perfecting his everyman persona into a family man kind of guy in numerous films after this, such as Parenthood and Father of the Bride (which also starred Short.) It was Chase, however, who at the time, was the star who had headlined the most successful films on his own, from Caddyshack to the first two Vacation movies. Here, Chase sort of takes a back seat to Martin, and that works out nicely. After all, Martin is the funniest, and he really delivers in this film as the sort of leader of the group. The three boys are working for the studio system when the film begins. And a big time Hollywood producer, played by Joe Mantegna, wants to put them in a bunch of crappy films that will just make some quick and easy money. Martin’s character, Lucky Day, tells him off. That’s when Mantegna blows up and fires them from being employees of the studio, kicking them out of the lot. Everything is taken from them in a matter of moments, including the clothing that they are wearing on their backs. Only they get a telegram from that town in Mexico, and that leads them to the mission of this movie. The telegram asks for help. Before we even met the Amigos, we saw the town where that evil leader, El Guapo, was attacking, and saw the woman, Carmen, looking for help. She and her son stopped in a Church, saw an Amigos movie, and sent them a telegram. This telegram included the amount she would pay them, a ridiculou number that she could never actually afford. Only the movie showed that after saving a small town, the Amigos did not accept their reward, but instead gave it back, claiming that the only reward they needed was to know that justice had been done. This led to Carmen thinking it didn’t matter how much money she was offering, for the Amigos would never actually accept it. With all this in mind, the Amigos break into the studio to steal their costumes, and then are on their way. Their first scene, once arriving across the border, is a stop off at a bar, where they are mistaken for German killers. I love that they movie takes the time to give us scenes like this. Every scene is quick moving and to the point, but at the same time, the film is not so short sighted as to only give us scenes that are directly related to the plot of stopping El Guapo. The bar scene is simply about having fun. The boys sing the song, “My Little Buttercup,” and the best part about it is that they get these reluctant Mexican tough guys to chime in on the song with them. After that, it’s off to the village, where Carmen gives them one single horse that all three men have to ride together. It’s quick sight gags like this that really make the movie. A lot of the dialogue and humor is dated, and doesn’t quite work, but it’s the sight gags, such as one where Dusty Bottoms, (Chevy Chase,) swings right into a closet, that still hold up. When the men arrive in the village, they are given a single bed to share, and the next day, they are convinced that they are performing a show when three of El Guapo’s men show up. Those men go running off and then El Guapo shows up, himself, with a whole group of men. It’s at this point that the Amigos realize the whole thing is for real and ride out of town. El Guapo kidnaps Carmen and then rides off as well. Soon the men are at El Guapo’s fortress, for what one might think is the climax. Only it’s not. The men have to get Carmen back, return to the village, and then defeat El Guapo in the village. I really like the way the movie has so much going for it, and yet doesn’t take a very long amount of time to give us this. The entire film is only an hour and forty minutes, which means that even though there is quite a lot going on, everything moves quickly. There is no wasting time here. That means that if a joke doesn’t work or land quite right, the film just keeps on going, in order to give us something else that might land a little better. While the story and humor here are both pretty good, the characters are a little simple and one-noted. Considering this is a comedy, and the main issue is whether or not the film is funny, that lack of character development is not really all that important. The other small problem is that the climactic scene in the village does seem to happen a little too fast. This is the one scene that we could have used a little more explanation or moments watching. For example, the people of the village do a whole lot of sewing, and it’s clear that they are making Amigos costumes, but the part that happens with a hole in the ground is rushed over way too quickly. And what ends up happening with El Guapos men, and the decision they make, also happens too quickly. Aside from these small flaws that really only appear at the very end of the film, however, this is a pretty great movie. It’s got a clever storyline about a giant misunderstanding, and most of the humor works out nicely.